Chimney liners and flue liners are stainless steel liners which, when installed into a masonry chimney, produce a continuous and unbroken flue from appliance or fire to outlet. This prevents flue gasses escaping though disintegrating brickwork and provides the optimum flue diameter for the appliance. For solid fuel appliances such as wood burning stoves, multi fuel stoves, open fires etc. Can also be used with gas fired appliances where condensate resistance is required, and oil fired appliances. For gas fired appliances (no condensate resistance) and appliances using up to 28 sec oil. 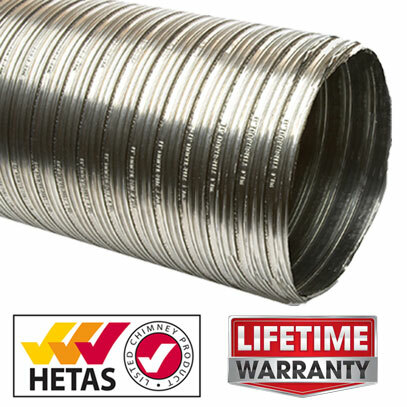 100mm (4") multi fuel chimney liner and installation components. 125mm (5") multi fuel chimney liner and installation components. 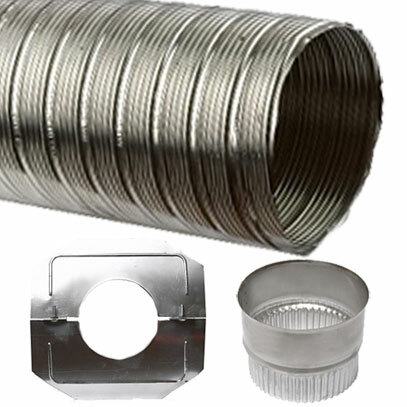 150mm (6") multi fuel chimney liner and installation components. 175mm (7") multi fuel chimney liner and installation components. 200mm (8") multi fuel chimney liner and installation components. 100mm (4") gas flue liner and installation components. 125mm (5") gas flue liner and installation components. 150mm (6") gas flue liner and installation components. 175mm (7") gas flue liner and installation components. 200mm (8") gas flue liner and installation components.